EuroCham offers many avenues for sponsorship and advertising. Our vast networks and business connections offer great exposure for your brand name. Come on board and sponsor a EuroCham event today! EuroCham offers a wide range of advertising & sponsorships opportunities to reach key players in Singapore! Our vast networks and business connections offer great exposure for your brand and will allow you to increase your brand exposure and visibility to target Senior International Business Community. A complete offer to meet your objectives! EuroCham esteems itself in offering a variety of high level events. We cater to each industry by offering the appropriate platform to expand and develop their business. We are a non-profit organization that supports European business organizations to build connections with other European organizations and promote business relations with Singapore. All of our events are primarily focused on promoting better business practices and unions. The Website is the ultimate channel to highlight your company’s profile. The website informs you about our events and activities, provides updates on the work of the Committees and features regular business news. 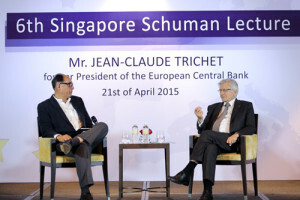 The website is frequently visited by members and non-members who want to stay abreast of what is happening at the European Chamber of Commerce in Singapore. The E-Newsletters are sent out on a monthly basis to our members and non-members, National Business Groups, Singaporean business entities and other interested parties. 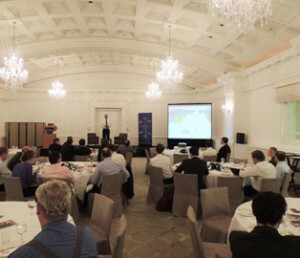 Besides featuring upcoming events it also provides information about our committees’ discussions and business events happening in Singapore and the region. The magazine features articles and highlights of past activities and events to reach out to a wide audience in Singapore, ASEAN and Europe. Printed in 1,500 copies, it is distributed among our members, National Business Groups, the Singapore business community, government representatives and key contacts in ASEAN. This makes the publication a popular choice among advertisers who want to connect with top business leaders in ASEAN and enjoy good exposure throughout the year. The blasts are sent on a weekly basis to our members only to effectively assist them in disseminating their desired piece of information. This opportunity is carefully monitored by EuroCham in order to make sure this information is used sparingly in order to be effective. Advertise your event or news on our Twitter or LinkedIn page. This opportunity is carefully monitored by EuroCham in order to make sure this information is used sparingly in order to be effective. Join our events as a sponsor and get access to targeted audiences and key decision makers. Enhance your corporate image, generate brand awareness, position your company as an opinion leader, highlight your company’s profile expertise or just be in touch with your target audience. The Schuman Lecture Gala Dinner, which highlights the remarkable achievements of the European integration since its modest beginnings. Europe Day Luncheon Celebration, which celebrates the 66th anniversary of the Schuman Declaration of 1950 that led to the creation of the European Coal and Steel Community and subsequently of the European Union. 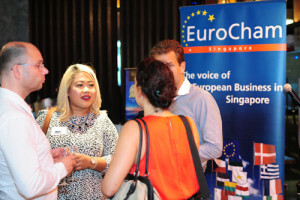 EuroCham organises Networking Nights in association with the European National Business Groups to provide a platform for the European and Singaporean business community at large to network and access to a wide and diversified audience. These events are attended by 80 to 100 participants and are held four times annually. Eurocham organizes these events for you; from the location, to the catering, to finding the attendees, the speakers and subject. If this is of an interest we will work together on the proposal. This allows you to benefit from our experience, network and gain exposure. EuroCham gives you the opportunity to advertise your event on our website as an upcoming partner event. EuroCham Meeting Room: Opportunity to increase your brand’s visibility! Our meeting room will be named after your brand and branded with your company’s logo. EuroCham Meeting Room: Host your event at the EuroCham, by renting our meeting room that can host up to 15 people. We organize several events per year and the success of those is based on the quality of our speakers. Do not hesitate to contact us to suggest topics and/or speakers for future events.